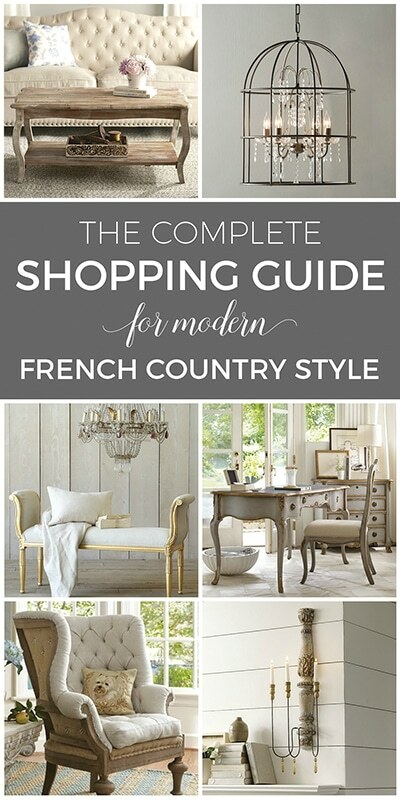 And I promised you 10 ways to save money when decorating with French Country decor. There are certain decor categories that lend themselves particularly well to this styling concept, as they offer options in both vintage and new. You can see five of those categories in the first post: HERE. This week I’m back to explore the remaining five. 1. 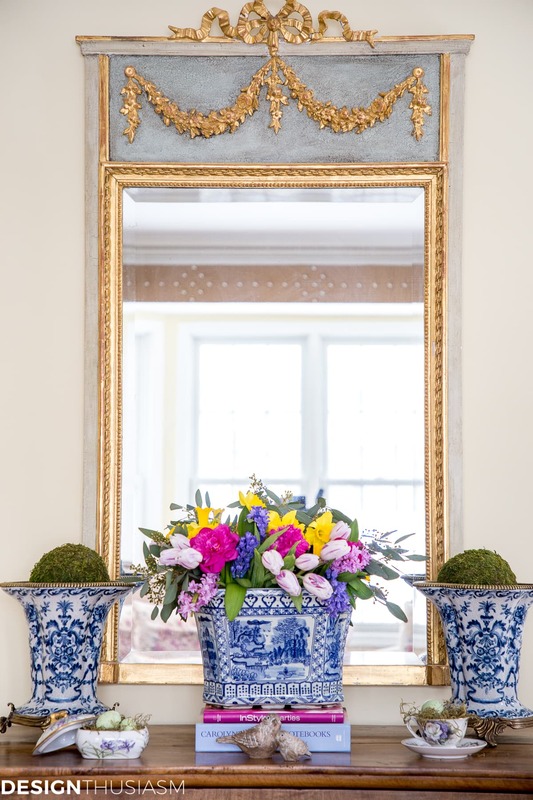 Gilded and trumeau mirrors: Mirrors are one of my favorite decor items. I have them in almost every room and I love the way they bounce the light around a room. I also love the opportunity they provide to add gorgeous decorative framing to your walls. 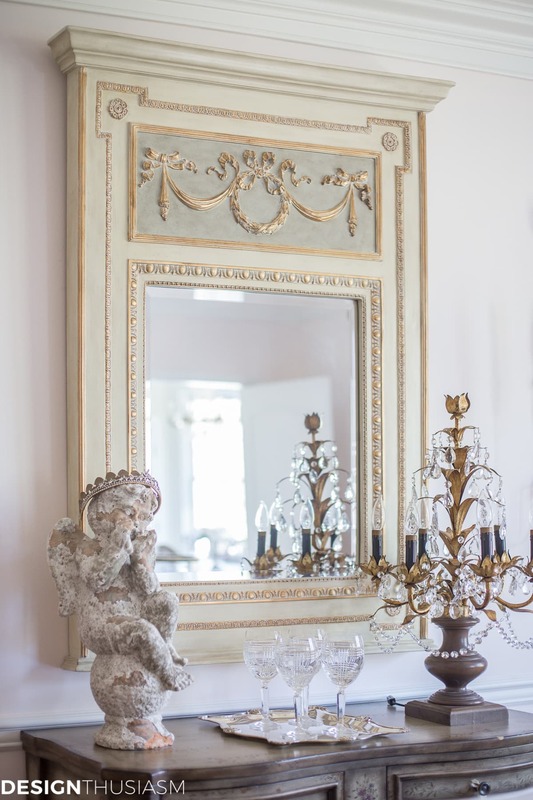 True antique mirrors can be quite pricey but they are also stunning, so I add them sparingly. The one above is among the oldest pieces I own, French and from the late 1700s. It’s my favorite piece, yet I’ve seen reproductions of this very style which would be a great way to save money. 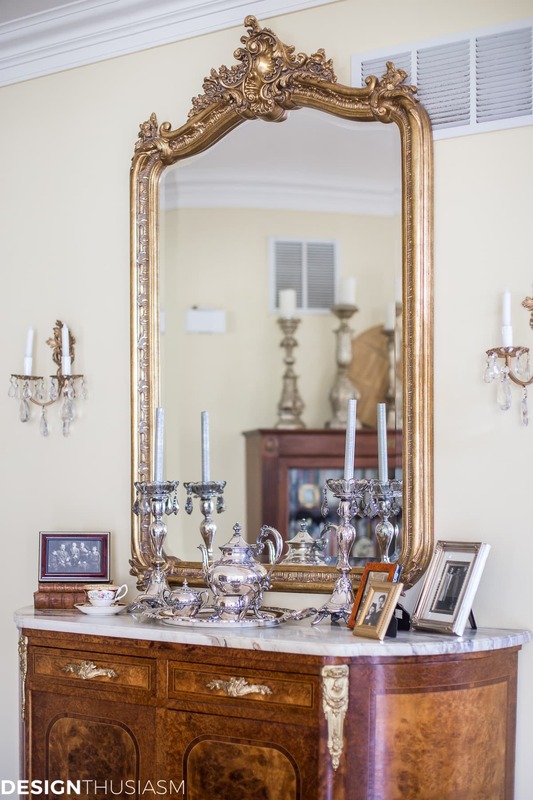 The trumeau mirror above is a reproduction piece that presides over my dining room. It may not have that same “crumbling authenticity” as the antique mirror, but it was significantly cheaper and still adds the right look to the room. To bolster it with a more genuine vintage feel, I’ve paired it with the chippy garden statue and the crystal girandole, both bought through antique sellers. The juxtaposition of these pieces is the real secret sauce, as the older pieces lend credibility to the scene. The mirror in the opening photo of this post is also a reproduction. 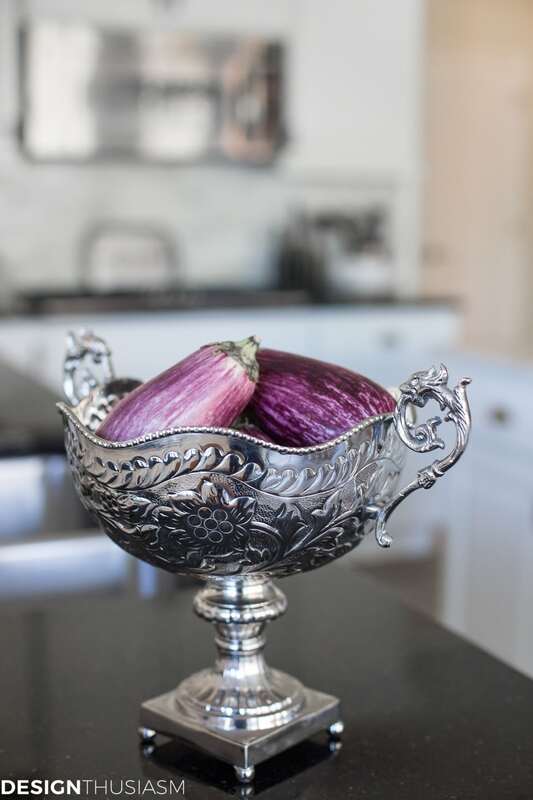 It sits above an antique French server and is another example of how I mix old and new together. I felt it was grand enough to keep it in my entryway and it’s flanked by vintage sconces brought back from Italy. 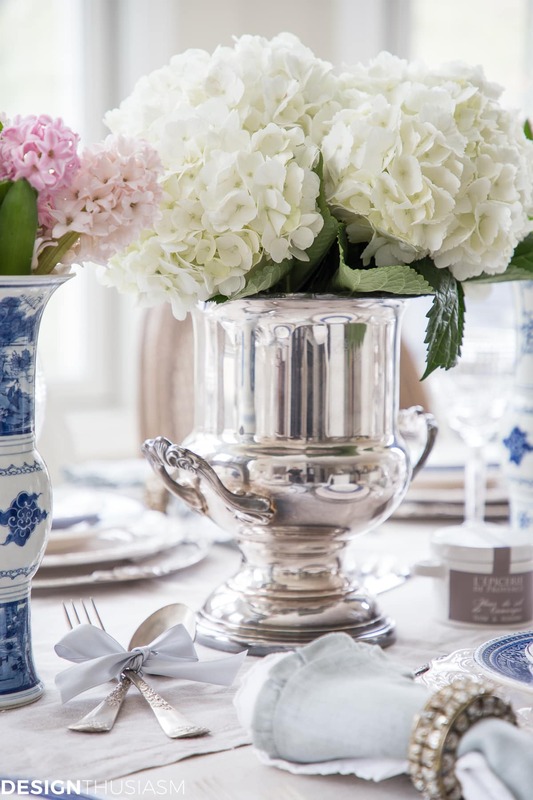 The server top vignette mixes new frames and china with antique books and silver pieces. 2. Candlestick holders: Another favorite decor category, I cannot seem to get enough candlestick holders! I wish I could find more pieces like the altar candlestick above, quite possibly the oldest piece I own, I found it in Florence and it hails from the Renaissance. A reproduction piece would be far less costly and when done well they can be quite pretty. But I still enjoy having one or two of the real thing. 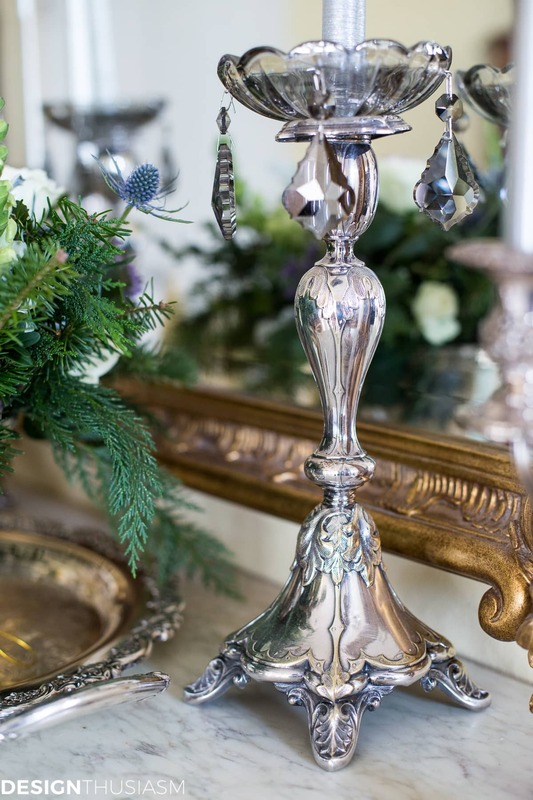 This silver candlestick is also antique, found in one of my favorite markets in London. The shop owner told me it was originally from Prague and one of the things I love about antiques is the stories they bring with them. The patina is lovely and as it’s a relatively small piece (compared to a piece of furniture), it was worth the splurge. 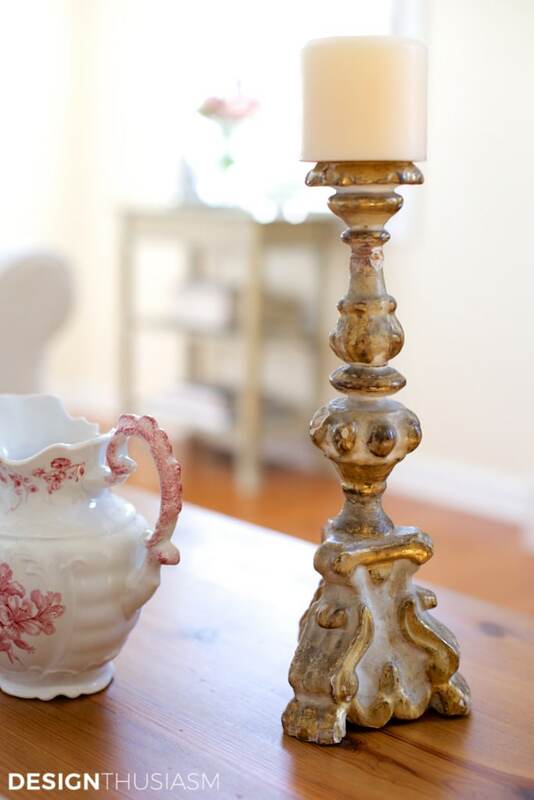 To round out the balance with the pricier pieces, I also collect reproduction candlesticks like the one below. They don’t bear the same pedigree, but these are quite tall and that’s a good place to save a bit of money. As always, the new pair flanks an antique dough bowl so that the mixed look still carries a vintage feel. 3. 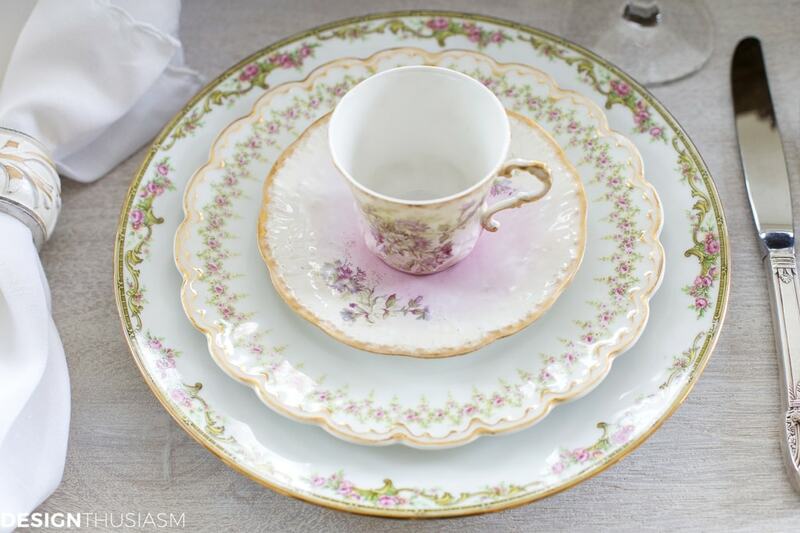 Floral china: I’m utterly enchanted by antique china and I love to mix varied patterns together. You never have to worry about having a full set if you mix and match, and for me it only adds to the charm. 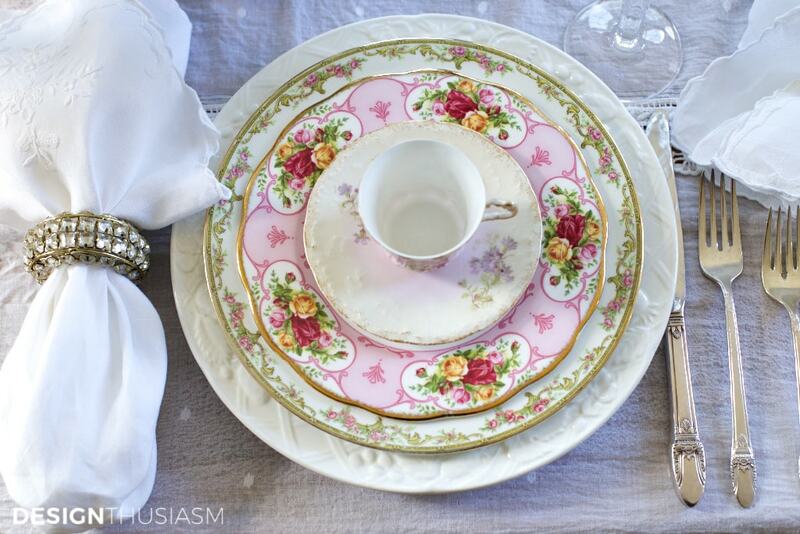 The dinner plate below was passed down in our family, while the salad plate is one of my vintage market finds. The demitasse cup and saucer are part of a set I found in the dustiest old shop in a sweet Paris neighborhood. When I look at the pieces I’ve collected this way, I immediately remember exactly where I was when I discovered them, often hiding on a shelf tucked behind other things, waiting to be unearthed. This is one of the greatest delights of decorating with antiques. Yet at the same time, I’m happy to supplement my collection of vintage china with brand new pieces that work just as well in the mix. Many of these old companies still produce new products, like the Royal Albert salad plate in the photo below. It’s a bit brighter than the faded patterns it sits with, but it’s equally lovely and when balanced with older pieces, it takes on a vintage look. 4. Chests of drawers: I just love vintage French and English chests! The patina of the wood, the delicacy of the trim and often the curvy lines are quite beautiful. But antique furniture can be very expensive and this is a category that offers many options for saving money. 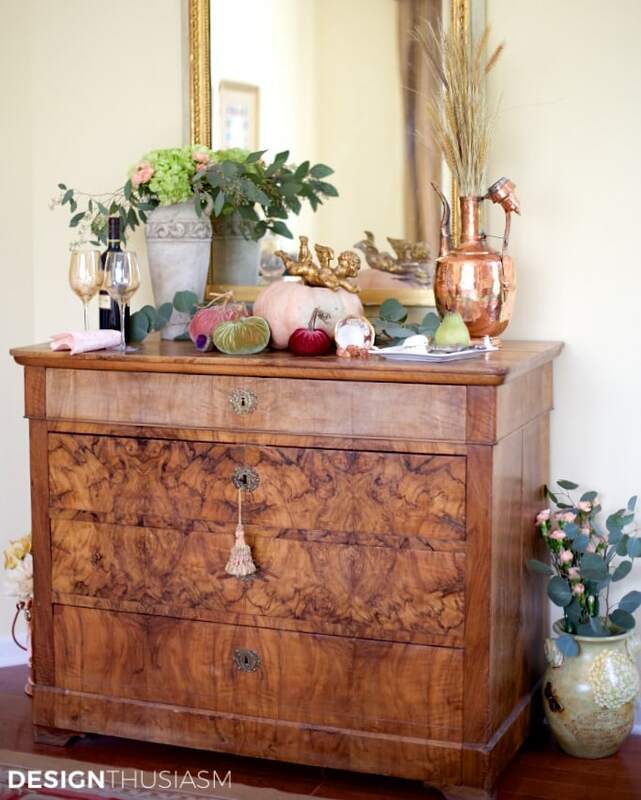 The burled wood chest below is an antique piece and I love the beauty of the wood grain. But the drawers do not slide very easily and there’s a gaping split in the wood top. This is likely what made the piece affordable, but I still enjoy having it in my living room, a room that could benefit from some more vintage selections. Still, in a room where you already have enough antique style, there are many reproduction chests that offer great optics with attainable pricing. 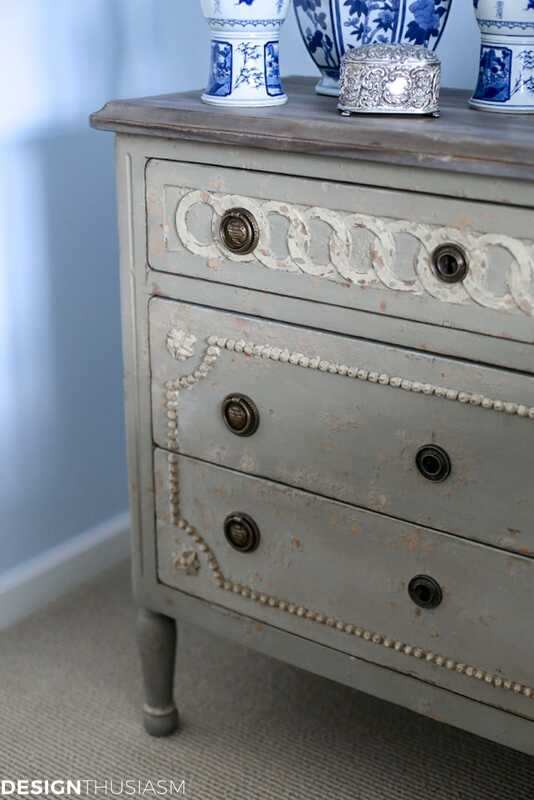 In our guest room, below, we have this new Gustavian chest that is beautifully made with a lovely finish. The drawers slide easily and it’s a pleasure to use. 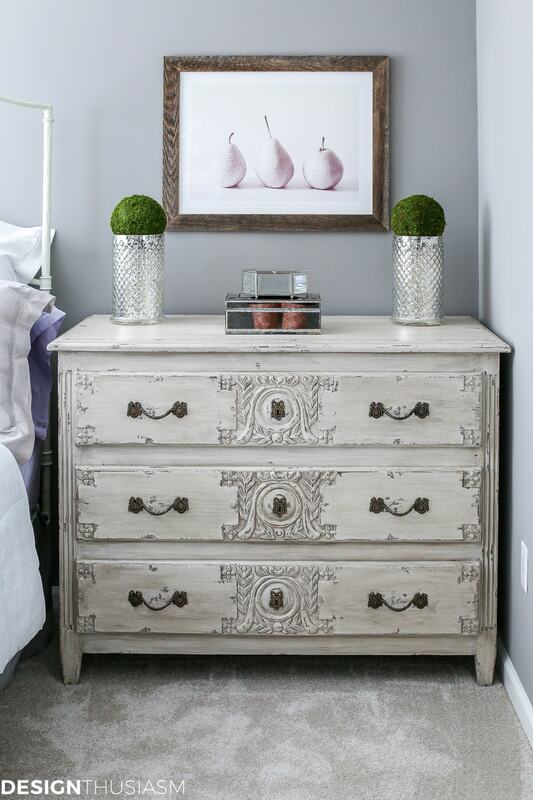 We also have this pretty painted white chest in my daughter’s bedroom and the simple fact is, when used for actual storage, particularly in a younger person’s room, you cannot beat a new piece. If this was mixed with a vintage mirror and some antique decorative pieces on the bureau surface, it would have a more genuine vintage feel. 5. 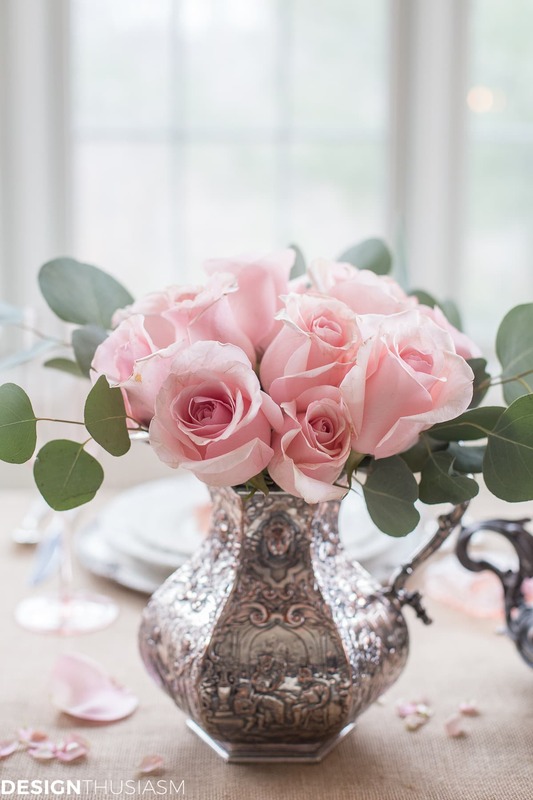 Silver vases and decor: The final category I will address today comprises silver pieces used as vases, pitchers, planters and more. There’s a broad range of pricing when it comes to vintage silver, depending on various factors including the age, content and quality of the silver. But real antique silver can cost a small fortune. The fruit bowl above is a new piece with gorgeous lines and an affordable price. Unlike vintage silver, it may shine a bit too much, but a large piece like this would be very expensive in antique sterling. It sits in my kitchen where I have lots of vintage items, so to add it in among the mix works very well. The champagne bucket above is an older piece but here I saved money by going with silver-plate. It picks up a nice patina and blends comfortably with pieces old and new. I did the same with the repoussé pitcher below, a very old piece, but also in silver-plate. I tend to save my sterling purchases for much smaller pieces with a lower price tag, like antique napkin rings and small bowls and dishes. For me, mixing real and faux is not just a matter of balancing expenses but also lends more interest to the decor in my home. I try to ensure that every single room has something truly French and genuinely old to provide an air of authenticity to the space. At the same time, newer pieces guarantee an updated look while also offering practicality. 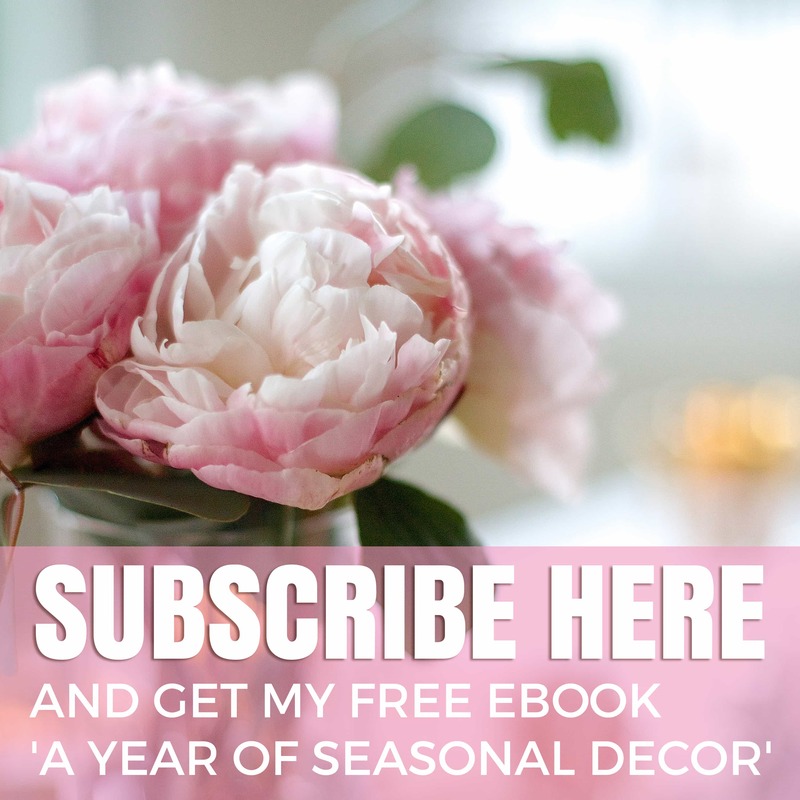 Everything in moderation they say, and this certainly applies to decorating, as well. So go ahead and splurge on that vintage piece that you absolutely have to have. But if you tap out most of your budget on the one piece, head to the reproduction section of your favorite online shop to finish your room. 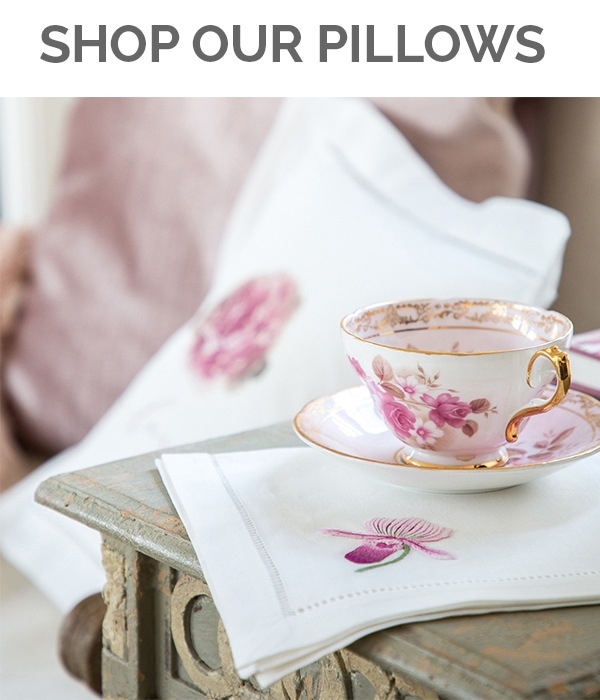 Your wallet (and maybe your husband) will thank you! 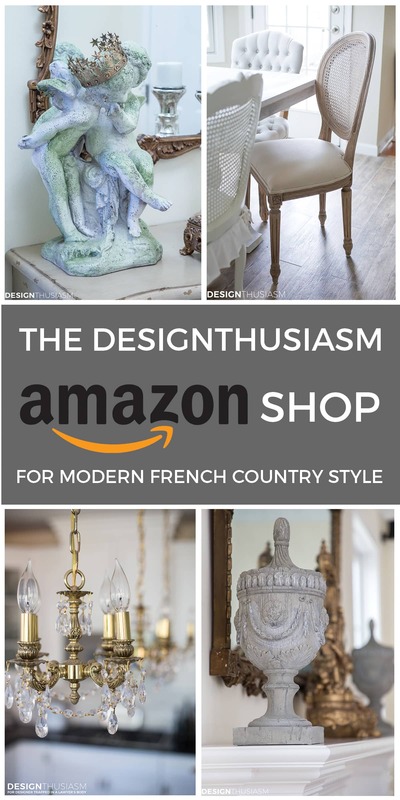 French Country Decor Source List – To get the look, click on the items below for direct links to the products. Where actual items were no longer available, I’ve provided similar options. I buy silverplate for my daughter when she moves out. I don’t buy sterling, in case she is in a share house. People come and go from those places leaving doors or windows unlocked, and it might get stolen. Thank you so much! I’m very happy using beautiful silver plate pieces. They can be just as lovely as silver and they get used often because people don’t worry about them so much… 🙂 Lucky daughter!! Gorgeous photos of very beautiful pieces. Here, real vintage is cheaper than new reproductions, and better quality (solid wood, for one thing). China is very easy to find for a song–it lasts forever, and every time people get married they get a new set (and then unload it when they get divorced); not to mention all the grandmothers’ houses that get emptied out every year. Silver is a little trickier–you have to be able to detect silver from silver plate. 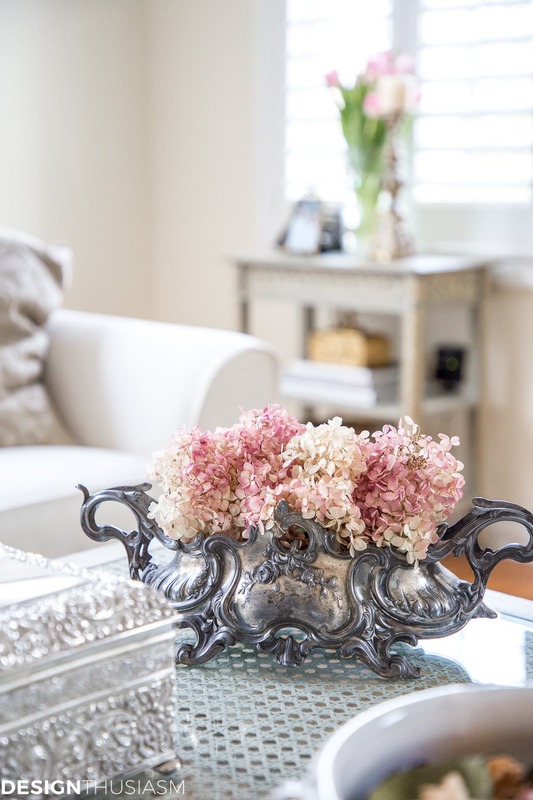 When I furnished our vacation rentals entirely with antiques, I was shocked to see just how much cheaper real antiques are vs. reproductions (except for things that have some amazing backstory, like having been owned by royalty–those antiques still cost a fortune). One of the reasons I love shopping overseas! But shipping furniture back is too costly. I do love to buy smalls when I travel. I noticed you display one candlestick. I thought they needed to be in a grouping on two or three. What are the “rules” for candlesticks? Isn’t it fun to find treasures while travelling? They always remind you of places and good memories. I’ll be on the lookout for antique candlesticks while in Prague. Hi Joanna! I don’t think there are any “rules” for decorating… 😉 I do tend to use mostly groupings or pairs for candlesticks, but a well balanced vignette can include several different objects including a single candlestick if you only have one. The Renaissance one is the only candlestick that I have only one of, so that one is always displayed among other objects. I do hope to eventually collect others to work with it, but for now, it usually sits next to a crystal vase and a gilt picture frame on a side table (although it moves around the house a lot). Hi, Lory. Sorry I haven’t been commenting for awhile…lots going on and we’ve been traveling quite a bit. I, too, mix some faux/reproduction with antiques. You are so spot on with all your decorating, and I think that’s the real trick when mixing things up. You have to know what items compliment and you have to have good taste or it just doesn’t work. I LOVE everything you do and have so enjoyed reading all your posts. On a side note, I’d like to invite you to my Pinterest boards ( I just got on board with this form of social media…talk about being slow!). 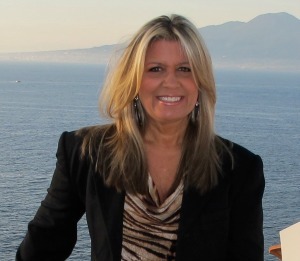 If you’d like to take a peak, I’m Bobbi Duncan (bobbid25). You’ll see several of your photos there as well, and there will certainly be many more to follow. Hugs! Thanks so much, Bobbi! I hope your travels have been fun… 🙂 Will certainly check out your boards when I have a chance. 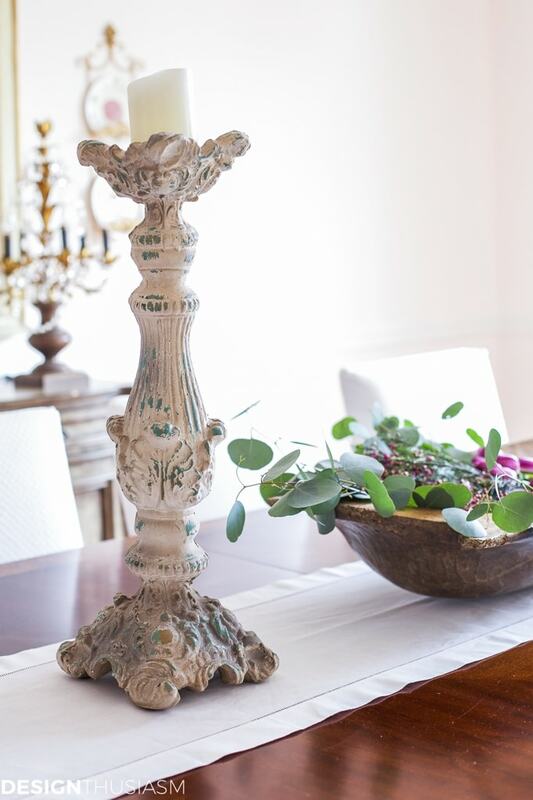 What are the hallmarks to look for when buying antique candlesticks? I have never bought one before, and could see myself getting tricked into buying something that was made to look old, but really isn’t. I think it’s really no different than buying any antiques. To some extent you can get a sense by looking at the item, but in terms of actual age, you pretty much have to buy from a trustworthy seller. For my silver candlesticks, I went by the same things I look at when buying any vintage silver. If it’s sterling, there should be markings on it. The candlesticks are also quite imperfect with bends in them that speak to their age. In the case of the wood altar candlestick from Italy, the paint is actually chipped as opposed to a paint technique. There are also actual splits in the wood. Can I know for certain it’s from a certain date? No. But I can easily tell it’s not new, or even close to new. Sometimes I think you also have to take into account where you are buying from. If I was in a mall in the United States, I might not be so likely to believe a candlestick was really old. But when rummaging through an antique shop in the shadow of the Duomo in Florence, it feels a bit more believable. Could they take advantage of the proximity? Sure. But if everything else in the shop is a gorgeous antique and the dealer seems to have a respect for the provenance of their items, I’m likely to trust their word. You have collected some lovely pieces in your travels and I admire how you juxtapose them with more current items. The Charity shops in Europe are so fun to shop in and sometimes have unique collectibles. 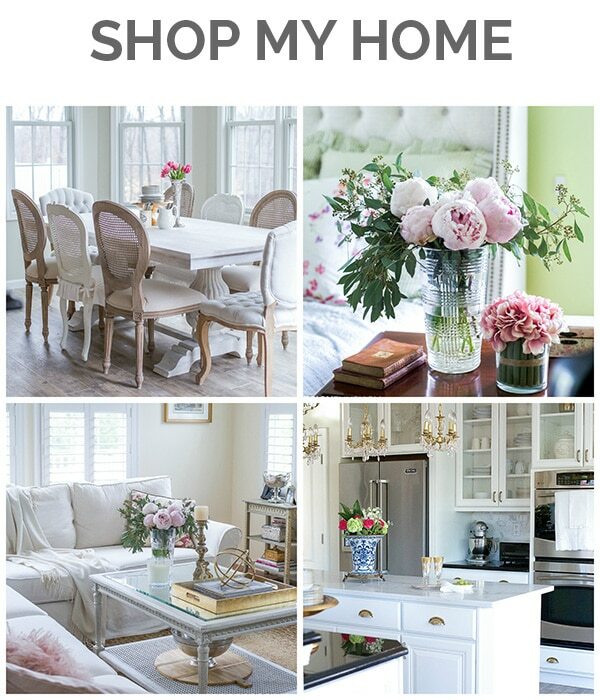 Your blog is so interesting and I enjoy seeing your lovely home.